Naples, Napoli in Italian, is the third-largest city in Italy, located in the Campania region in the southern part of the country. It's about two hours south of Rome, on the coast on the northern edge of the Bay of Naples, one of the most beautiful bays in Italy. Its harbor is the most important port in southern Italy. The name of Naples comes from the Greek Neapolis, meaning new city. Its close proximity to many interesting sites, such as Pompeii and the Bay of Naples, makes it a good base for exploring the area. Naples is a vibrant and chaotic city, full of wonderful historical and artistic treasures and narrow, winding streets with small shops. You could easily spend a few days here and just begin to scratch the surface. Piazza del Plebiscito is the center of modern Naples. San Francesco di Paola, on the piazza, is a huge domed church. Palazzo Reale, the Royal Palace, is across the square (closed Wednesdays). Inside you can visit the restored rooms and royal apartments and visit the roof garden where there are sweeping views of the Bay of Naples. Via San Gregorio Armeno, off Via San Biaggio, is famous for its nativity workshops and stores. Via dei Tribunali, another street in old Naples, has arcades dating back more than 1,000 years. The Duomo is a 13th-century Gothic cathedral dedicated to Naples' patron saint, San Gennaro. 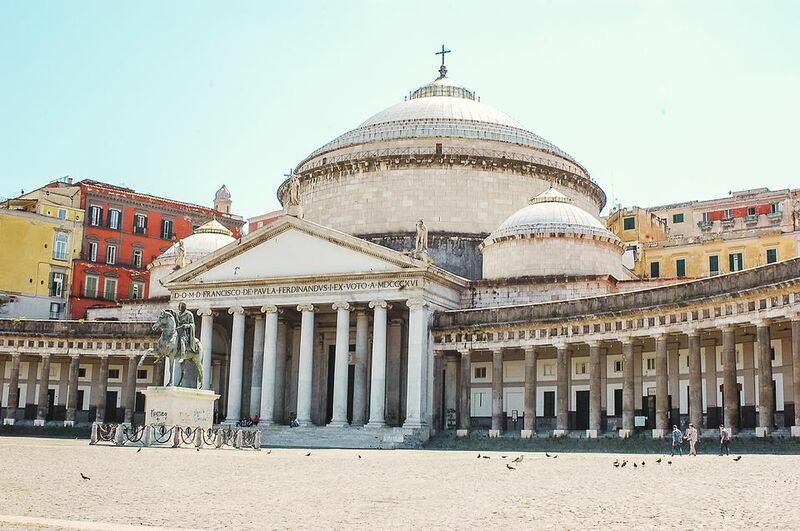 On one side of the Duomo is the 4th-century Basilica Santa Restituta (the oldest church in Naples) with columns believed to be from the Temple of Apollo, good ceiling frescoes, and archaeological remains from the Greeks to the Middle Ages. The 5th-century baptistery has intricate 14th-century Byzantine-style mosaics. San Lorenzo Maggiore is a 13th-century medieval church with extensive Greek and Roman remains underneath. Piazza del Mercato has probably been a market square since Roman times. Castel Nuovo, a huge castle constructed from 1279-1282, houses the Civic Museum (closed Sundays). Inside are 14th-15th century frescoes and paintings, silver, and bronzes from the 15th century to present. Teatro San Carlo, known for its perfect acoustics, is the best place to hear opera in southern Italy. Opened in 1737, it's the world's oldest surviving opera house although it was rebuilt in 1816 after a fire. The Capodimonte Museum and Park, built as King Charles III's hunting lodge, houses one of Italy's richest museums with a great picture gallery and collection of majolica and porcelain. You can wander around the royal apartments and the surrounding park, too. Museum and Monastery of San Martino, on the Vomero Hill, has a famous display of Neopolitan nativity scenes, beautiful cloisters and gardens, frescoes and mosaics, artwork, and fantastic views. Funiculare, inclined railways, take you up the hill to the Vomero district where you'll find fabulous views, Castel Sant'Elmo, and Certosa and Museum of San Martino. Funiculare Centrale, one of the longest in the world, leaves from Via Toledo by Galleria Umberto. The other two are Funiculare di Chiaia and Funiculare di Montesanto. The Orto Botanico, botanical garden, is one of the best in Italy. Naples University, founded in 1224, is one of Europe's oldest universities. Bay of Naples - Many interesting destinations on the Bay of Naples and in Campania can easily be visited from Naples. Pizza, one of Italy's most famous foods, originated in Naples and is taken very seriously here. There are even rules about what types of flour, tomatoes, cheese and olive oil can be used in authentic Neapolitan pizza. Be sure to seek out a restaurant with an authentic wood-burning oven – if you've never tried pizza cooked this way before, you're in for a life-changing experience! Pizza isn't the only Italian dish that originated in Naples. Eggplant parmesan was first served here, and the region is often associated with the traditional spaghetti and tomato sauce. And since Naples is a port city, excellent seafood is easy to find. Naples is also known for its wines, and for its rich, decadent desserts, such as zeppole, a doughnut-like pastry served on St. Joseph's Day and Easter. It's also the home of limoncello, a lemon liqueur. Naples has one of the best and biggest New Year's Eve fireworks displays in Italy. During Christmas, hundreds of nativity scenes decorate the city and the streets. Via San Gregorio Armeno in central Naples is filled with displays and stalls selling Nativity scenes. Probably the most important festival in Naples is the San Gennaro Feast Day, celebrated on September 19 at the Cathedral with a religious ceremony and procession and street fair. On Easter, there are many decorations and a big parade. Naples is the main transportation hub for southern Italy, with several major train lines. The train and bus stations are in the huge Piazza Garibaldi, on the eastern side of the city. Naples has an airport, Aeroporto Capodichino, with flights to other parts of Italy and to Europe. A bus connects the airport with Piazza Garibaldi. Ferries and hydrofoils run from Molo Beverello to the islands of Capri, Ischia, Procida, and Sardinia. To put it the most mildly, traffic in Naples is hectic – there's absolutely no reason for tourists to try to drive here. The city has a large but crowded network of buses, plus trams, a subway, and funiculars. Most sights in the historic center are within a reasonable walking distance of one another, though a word of caution: drivers in Naples are aggressive and not always willing to yield to pedestrians. Be very, very careful when crossing streets, even at marked crosswalks. Naples' suburban train line, the Ferrovia Circumvesuviana, connects to Herculaneum, Pompeii, and Sorrento. Read more about Day Trips from Naples. Naples gets quite hot in summer, so spring and fall are the best times to visit. Since Naples is near the coast, it's more temperate in winter than the interior cities of Italy.